Protesters pelted police with stones and the latter hit right back with vengeance wielding batons with telling effect, leaving many fallen and writhing in pain on the road. The iron gates of Sabarimala temple opened on Wednesday evening for the first time since the Supreme Court allowed women of menstrual age to enter the shrine but by all indications none from the “banned” age group could make it to its hallowed precincts amid a welter of protests and violent clashes. 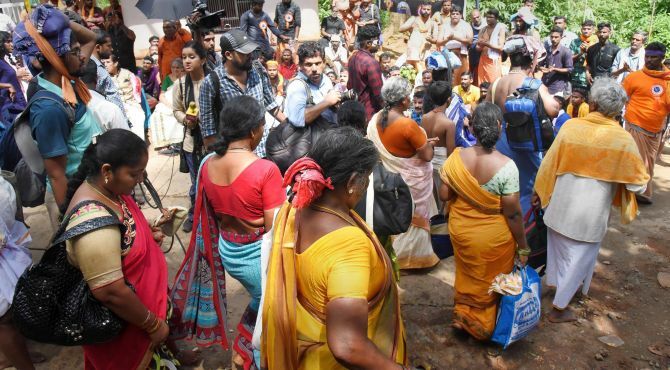 Chaos and mayhem ruled supreme on the road leading from Nilackal, the gateway to the shrine, to Pamba in the foothills from where the devotees start the arduous trek to Sabarimala, as activists of Hindu fringe groups fought pitched battles with police, leaving many injured and bleeding. 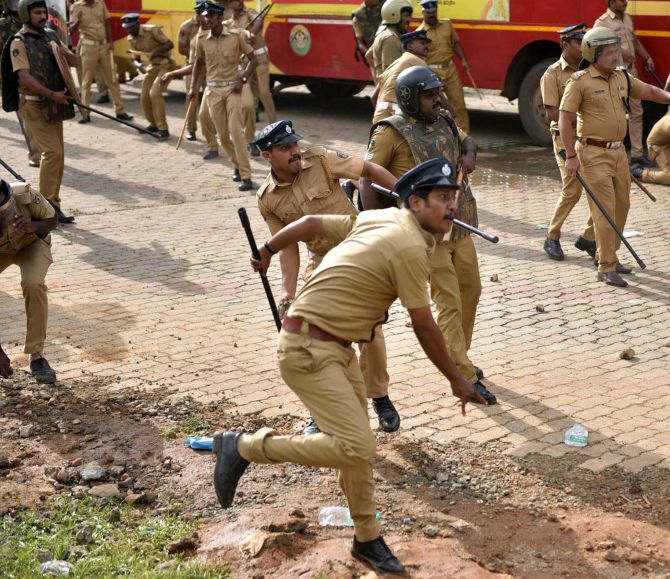 Incensed over Kerala’s Left Front government’s decision not to file a review plea against the Supreme Court’s September 28 landmark order, protesters pelted police with stones and the latter hit right back with vengeance wielding batons with telling effect, leaving many fallen and writhing in pain on the road. 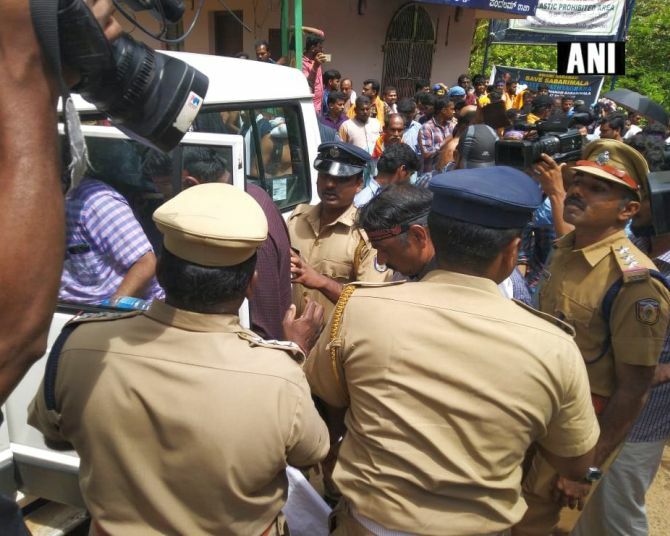 Simmering tension prevailing in Nilackal since morning erupted into raucous rowdy behaviour as scores of activists of fringe groups heckled women journalists of at least four national TV channels and vandalised their vehicles. 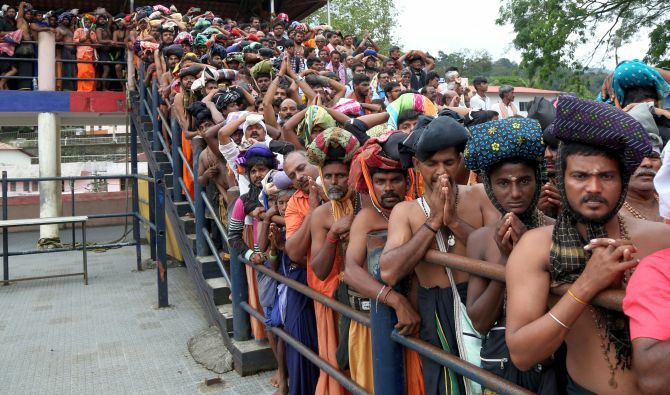 forced to return to Pamba, menaced by agitated male devotees. 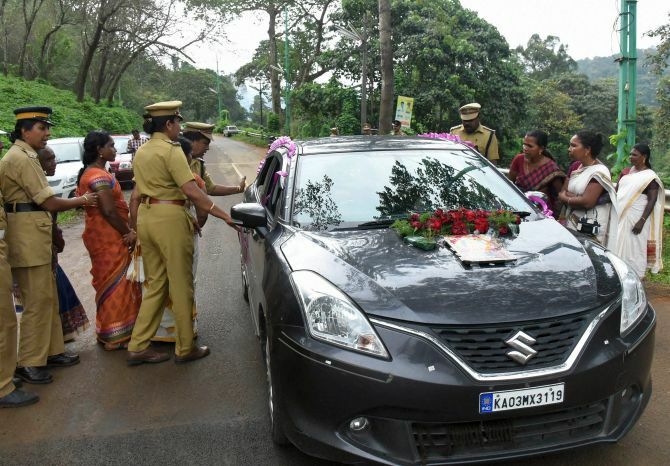 Liby, a woman from Kerala’s Alappuzha, also in the “banned” age group, was prevented from proceeding to Sabarimala at Pathanamthitta bus terminal. She was escorted to safety by police. Both the Congress, the main opposition party in Kerala, and the Bharatiya Janata Party, which is desperately seeking to expand its footprint in the state, have lent supprt to the agitation against the Supreme Court verdict. An embattled Left Front government reacted sharply to the protests, with the state’s religious trusts minister Kadakampally Surendran calling them “politically motivated”. “The BJP-RSS are trying to create tension and destroy the peaceful atmosphere in Kerala for political gain. We know the agenda of the RSS and BJP very well,” he said, and insisted the government did not want any confrontation with believers. The BJP rejected the allegation, saying the government was responsible for the “collapse” of law and order. Congress leader Ramesh Chennithala blamed both the ruling Communist Party of India-Marxist and the BJP-RSS combine for violence. 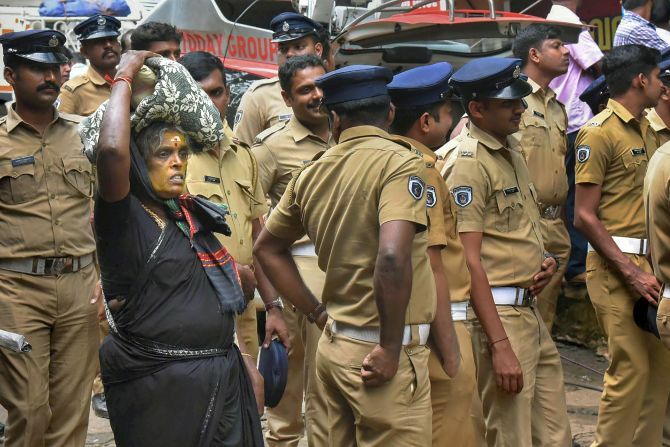 Carrying “Irumudikettu” (the sacred bundle containing ghee-filled coconuts they offer to the deity), they calmly walked past security personnel to take their place in the long queue where they would wait for hours on end for a glimpse of Lord Ayyappa. 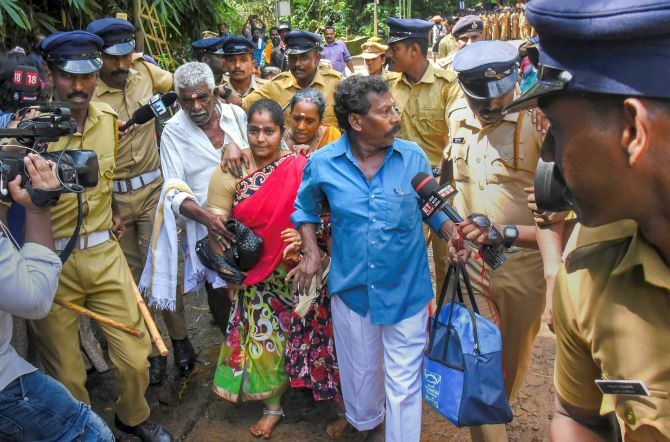 “No girl or woman in the age group of 10 and 50 has so far visited Sannidhanam (the temple complex) so far,” a senior official of the Travancore Devaswom Board, the body which manages the shrine, said wishing not to be named. The Pathanamthitta district authority has promulgated prohibitory orders under section 144 CrPC banning assembly of four or more people in strife-torn Pamba and Nilackal following Wednesday’s violence and a strike called by right wing outfits. ‘Antharashtriya Hindu Parishad’ led by Pravin Togadia and the ‘Sabarimala Samrakshana Samithi’, an outfit of devotees, have called a 24-hour-long hartal starting midnight. 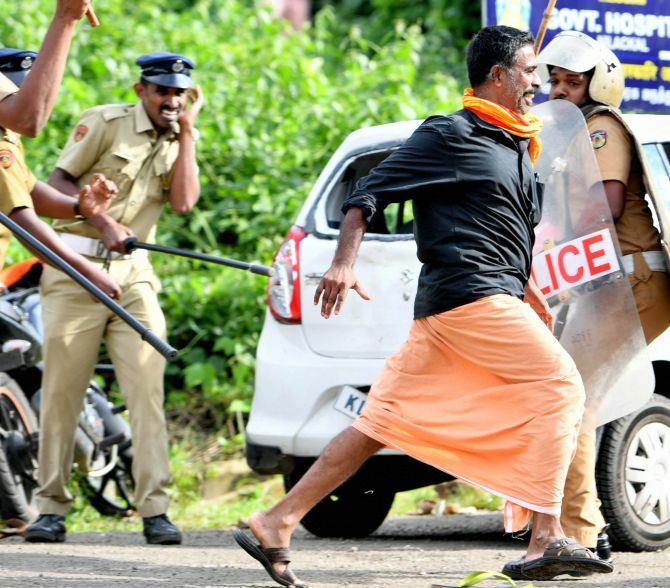 The BJP and its NDA partners have backed a 12-hour ‘hartal’ called by Sabarimkala Action Council to protest the police action against devotees. The Congress said it would not join the strike but hold protest demonstrations across the state on Thursday.